Our comprehensive electrical training courses are suitable for non-electrical and electrical trade personnel of all ages, backgrounds, and levels of proficiency, so whether you want to start or progress your career, Access Training can help. 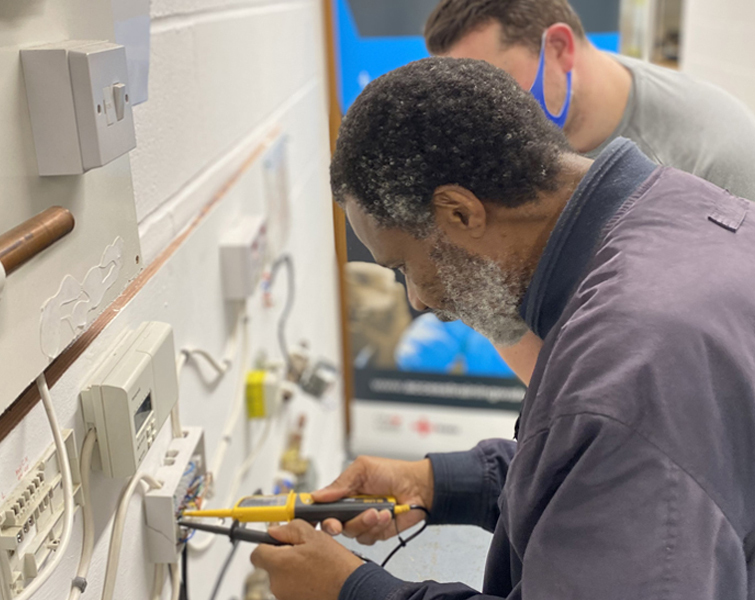 Our electrical training programmes have helped countless people to gain industry-recognised qualifications and become fully certified electricians; we can also help experienced electrical workers to refresh and build upon their previous training. Please select one of the options listed below, or call Access Training on 0800 345 7492 to learn more about how we can help you to get qualified. Our basic electrical training course – learn the ropes and get qualified! This course covers all the essential principles of electrical work, including electrical safety, earthing and bonding requirements, and how to install and replace a variety of components. Get qualified and kick-start your career as an electrician! Our Professional Electrical Course is for beginners who wish to learn the fundamentals of electrical work. Our deluxe electrical training package! All professional electricians must be familiar with the 18th Edition Wiring Regulations – this course will equip you with all the essential knowledge, allowing you to achieve your 18th Edition qualification and meet the standards required of workers in the electrical industry. People who wish to learn inspection and testing skills will find that our Fundamental Inspection & Testing course meets their needs perfectly. This course will enable you to gain the Part P Domestic Installer certificate – a critical qualification for any electrical worker – in a very short period of time. Are you unmotivated by your current job? Our intensive electrical training courses are designed to give you hands-on experience and give you all the necessary qualifications so that you can change careers quickly. It would normally take 2-3 years to become a fully-qualified electrician, but our practical training programmes allow you to earn industry-standard qualifications in much less time! Our electrical training courses are open to all adults, regardless of age, background, gender, or previous experience. Our flexible course schedules will allow you to complete your training around your personal commitments - if you need to carry on with your current job while training for your new career, or if you have other commitments to work around, we will endeavour to accommodate you. Of course, we don’t exclusively offer electrical training programmes for newcomers. We can also help established electricians update their existing qualifications with advanced courses and specialised training. Contact us today for more information. We always keep our class sizes small, ensuring that each student receives plenty of contact time with his/her appointed tutor. Our approved centres are fully equipped to provide trade training programmes. Access Training Academies’ electrical courses give you hands-on experience through practical training while also covering all the necessary technical theory. Historically, our pass rates have consistently been above the national average. Join a Competent Person Scheme, officially registering you as a safe, proficient domestic electrical installer. We can provide flexible, intensive training courses during the week and weekends to suit your individual needs. If you need a specific electrical training package, we are capable of delivering bespoke courses. Are you already a practising electrician?